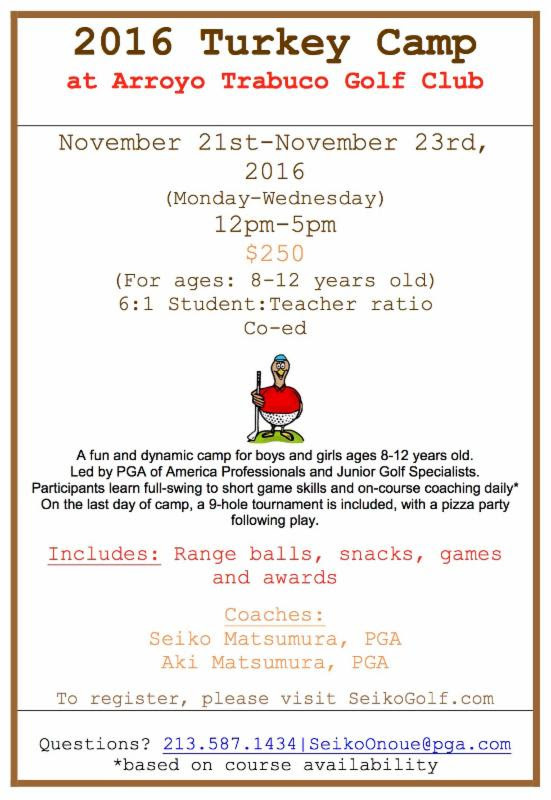 Sign your little turkeys up for Turkey Camp at Arroyo Trabuco Golf Club. Turkey Camp has become a tradition at our golf course. Every year during the week of Thanksgiving kids come to our course for a fun and dynamic camp led by PGA of America Professionals and Junior Golf Specialists. It’s the perfect way for grateful golfers to inspire their children to take up the awesome sport. The camp is for boys and girls from 8 to 12 years old. The camp is Monday, November 21st to Wednesday, November 23rd from 12:00 pm – 5:00 pm each day. Each child will learn full-swing to short game skills and receive on-course coaching. On the last day of camp the lil turkeys will play in a 9-hole tournament and then enjoy a pizza party with their new golf friends. The qualified coaches leading Turkey Camp are Seiko Matsumura, PGA and Aki Matsumura, PGA.